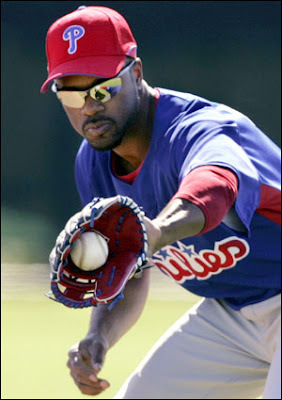 A pair of key Phillies contributors were sidelined this week, as both Jimmy Rollins and Brad Lidge were inactive with new ailments. Rollins, who has already spent two stints on the disabled list this season with a calf injury, strained his right hamstring while running out a double on Wednesday against the Marlins. He was removed from the game and sat out Friday's contest in New York, following a day off. Rollins is expected to sit out Saturday's afternoon contest against the Metropolitans and quite possibly Sunday's series finale as well. No additional rest should be required, provided Rollins does not experience a set back. 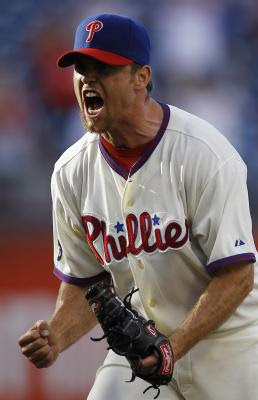 Lidge hyperextended his elbow last weekend, and the condition worsened as he continued to throw after feeling discomfort. The decision was made to give Lidge a few days off, and after throwing a side session without a set back on Thursday, Lidge is expected to throw for the Phillies this weekend in New York. Early reports that Lidge would be available on Friday were accurate, but since the Phillies did not have a save situation in their 8-4 defeat of New York, Lidge received an extra day of rest. The hyperextension occurred when Lidge was overthrowing his fastball. A mechanical adjustment could be in store for for the Phillies' closer. I'll be appearing on 97.3 ESPN (WENJ) today around 1:15pm to talking Phillies baseball. Listen live online by clicking here.